Most of the Software applications running on older versions of Windows will run fine on Windows 8. In case a software running fine on Windows 7, Vista or XP does not runs on Windows 8, there is inbuilt compatibility mode for older operating systems by Microsoft. 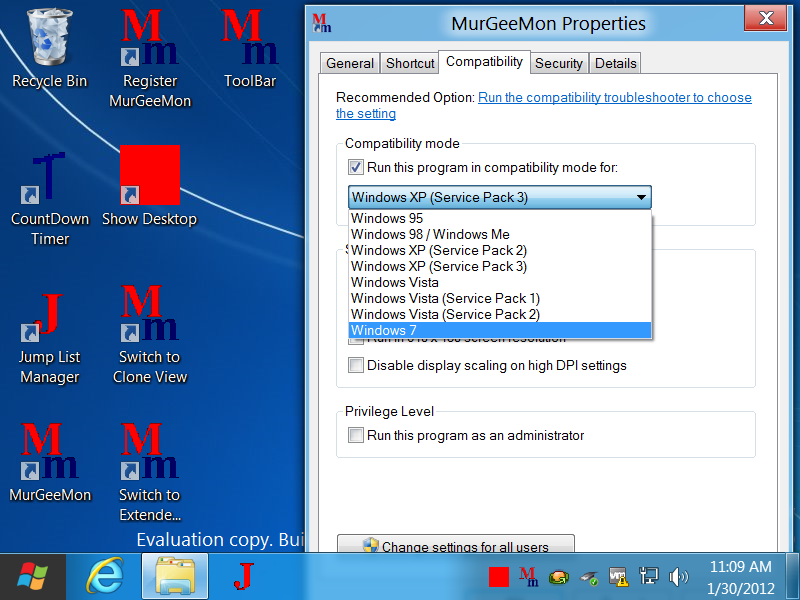 Given below screenshot displays the compatibility settings of an application. Once the compatibility mode is switched on for a given application, you might be prompted to with the UAC prompt to run that application in compatibility mode. The backward compatibility of Windows 8 will allow you to select how to run an application or utility as if it is running in an older operating system such as Windows 7, XP, Vista, even Windows 98 and Windows 95. Windows 7 was a significant improvements over Windows Vista and now Windows 8 should come out with even better support & new features. 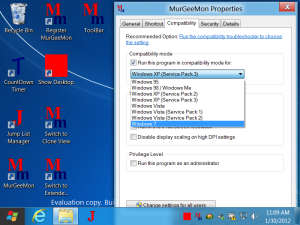 Software applications which interact with device drivers such as AntiVirus software applications do not stand a chance to be run using this compatibility settings. When author attempted to install an AntiVirus application on Windows 8 , it crashed the Windows 8 and the author was not very interested in fixing the issues with Windows 8. In case you want to try out Windows 8 on your spare hard disk or on a virtual machine, download windows 8 from microsoft website for free now and give it a try. In case you do plan to install Windows 8 on a virtual machine such as Free VMWare or other such software, make sure that your host computer does has enough RAM and processor cycles to spare. In case you do plan to upgrade to Windows 8 or buy a brand new edition of Windows 8 and are worried about some software, you do have many options. First option would be download the Windows 8 for free, install your software application(s) onto it and use it for a while to understand whether your software works fine on Windows 8 or not. In case you do not want to download the Windows 8 now, try to contact your software provider and ask them whether the software application(s) would work fine on Windows 8 or not. The compatibility mode in Windows 8 can be of rescue in case you software utilities do not work fine on Windows 8. As the final version of Windows 8 is expected in April 2012, the new operating system can have bug fixes or improvements in the current version of Windows 8 available for download. Traditionally Microsoft does provides a 90 day trial of final version of the operating system and yes the trial version of the operating system does gets software updates as like any other version.